Germany were dominant for large portions of the match, but they committed two suicidal mistakes in their penalty box which handed France a route to the Euro 2016 final. Joachim Low was forced to make a few changes due to suspensions and injuries and once again altered his system. Thomas Muller moved upfront for the injured Mario Gomez, which allowed Julian Draxler to return to the starting XI. Emre Can slotted into midfield for Sami Khedira and Benedikt Howedes shifted to centre-back alongside Jerome Boateng. Despite Adil Rami and N’Golo Kante being available for selection, Didier Deschamps named an unchanged lineup. Didier Deschamps may have got his tactics wrong, but France’s clinical finishing overcame an impressive German display. Similar to the quarter-final stage, Joachim Low’s decision to alter his stem was the main talking point of the round. Here, Low turned to the 4-3-3 that was successful at the World Cup, and it appeared Can’s inclusion was with the intent to offer a physical presence in the midfield zone. Low probably assumed Deschamps would recall Kante into midfield, but the French manager’s decision to persist with a 4-4-2 left the hosts vulnerable in central areas as neither are natural holding midfielders. Bastian Schweinsteiger dropped between the centre-backs for additional cover, which enabled the centre-backs to push into midfield and the wing-backs to position themselves in advanced positions by the touchline. This was another example of Low’s growth as a manager, as his tactical rejig was responsible for Germany’s dominance throughout. Deschamps didn’t instruct his men to press higher up the pitch, but he focused on limiting space in central areas to exploit. The hosts maintained their two banks of four out of possession, but the peculiar aspect to their approach was the reluctance to close down Germany’s chief passers in Schweinsteiger, Toni Kroos, and Boateng. Kroos dropped deep to receive possession and was occasionally pressed by Paul Pogba, but in comparison to the Italians instructing Graziano Pelle or Eder to stick tight to the German, this was a contrasting defensive display. Boateng, on the other hand, was free to step into France’s third of the pitch to hit diagonals to the advanced full-backs, but fortunately for the hosts, neither Hector nor Joshua Kimmich translated their dangerous positions into quality chances. Besides allowing Germany’s creative passers time and space to dictate the tempo of the match, the main issue Deschamps’ men encountered involved their ability to break on the counter. Apart from positive combinations between Antoine Griezmann and Blaise Matuidi, and the former with Patrice Evra down the left, France didn’t appear capable of testing Manuel Neuer from open play. Although Germany’s counter-pressing played a factor, but ultimately it was down to sloppy passing in transition that halted possible counter-attacks. There were two situations that witnessed Griezmann launch an attack only to have his pass cut out by Schweinsteiger, and then playing a poor pass back to the Germans. In many ways, France were responsible for their shortcomings in the first half. Their reluctance to press Boateng, Kroos or Schweinsteiger enabled the Germans to retain possession, and when they did so, it wasn’t cohesive and created space for the attacking midfielders to exploit between the lines. Likewise, this also meant the full-backs, pegged the wingers deeper into their half, so when Griezmann did receive opportunities to break forward, he lacked passing options, which is partially responsible for his poor decision making in transition. Nevertheless, the biggest mystery heading into half-time was how France found themselves ahead. The Germans territorial dominance merited a goal, and they used space wisely throughout the final third. It was evident Germany aimed to exploit space down the right to exploit Dimitri Payet’s unwillingness to protect his full-back. Germany essentially had three players operating in this zone in contrasting directions – Ozil drifted centrally, an advanced Can darted vertically or diagonally into the right channel, whereas Kimmich offered width by hugging the touchline. There were shades of the positional understanding between players on the opposite flank where Ozil passed the ball to Hector and immediately sprinted towards the touchline, with the left-back aiming to cut infield from the flank. 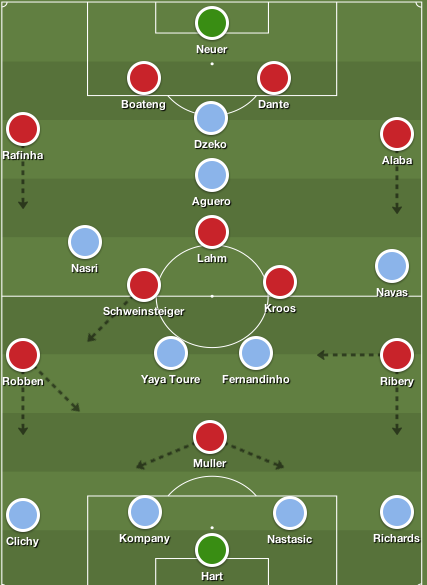 In truth, Low’s approach was working to fruition – the midfielders were able to play forward passes and the advanced positioning of the full-backs enabled Draxler, and specifically Ozil freedom to receive the ball between the lines. 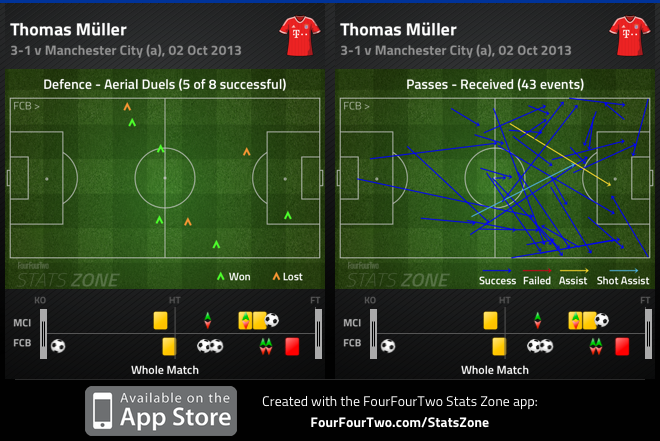 More so, Thomas Muller’s sluggish performance proved decisive. 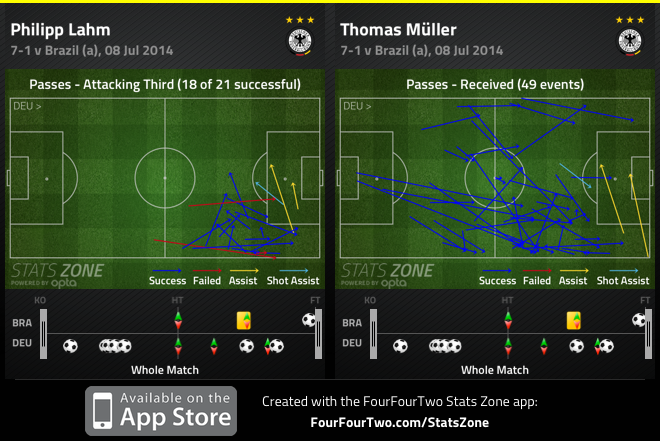 Muller was easily marked by both centre-backs in the box, and doesn’t offer an identical penalty box presence to Gomez, who has been the key component to the German attack. Therefore, Germany struggled in the final third, which shouldn’t be a surprise considering Muller has failed to excel as a lone striker for his country. Meanwhile, Germany’s attack has been predictable and lacking the quick combinations to get behind a low defensive block without Gomez. The few chances Low’s men created stemmed from the right, and despite the clever passing and interchangeable movement, poor penalty box finishing proved costly. With that being said, France took the lead during injury time of the first half courtesy of another German blunder. Boateng was culpable for an additional 30 minutes of extra-time following his hand-ball against Italy, and here, Schweinsteiger committed the same mistake. It’s unusual to see experience players on elite teams make silly errors, and this was nearly identical to Boateng’s hand ball. Evra attacked a near post corner ahead of Schweinsteiger, and nodded the ball into the German’s hands, which led to Griezmann converting a penalty to put the hosts ahead. Griezmann’s opener encouraged the French to sit deeper out of possession, while Low’s men stuck to their initial approach and probed within the final third. Germany’s best chance in the opening 15 minutes of the half witnessed Ozil drop deep to receive and the ball, and subsequently clip it over Bacary Sagna to Hector but the German defender couldn’t control the pass. Perhaps the German’s created minimal chances in the second half due to France remaining more compact with a deeper shape, but Boateng’s departure for Shkodran Mustafi decreased their creativity from deep. Kroos still dropped deep to cycle possession throughout, but even a change to a 4-2-3-1 with Draxler and Mario Gotze upfront was unsuccessful. Germany continued to find joy down Payet’s flank so Deschamps turned to Kante to offer protection in midfield and negate Hector’s forward runs by transitioning to a 4-3-3. Oddly, France sealed the game seconds later, as they finally pressed the German back-line in their box for their first time as a unit, and were able to see Griezmann confirm their place in the finals. The game suddenly became stretched with Germany pushing for a goal. Although it seemed logical France would receive more chances to win the game now, Deschamps’ men still struggled to cause havoc via the counter-attack, whereas Kroos’ set-piece deliveries placed his teammates in several key areas where they failed to convert their chances. This was arguably one of the best performances of the tournament from Low’s German side, yet they failed to win due to silly errors from their defence. Low displayed his tactical nous by altering to a 4-3-3 which witnessed the Germans dominate central areas, and prevent France from breaking on the counter attack. Injuries played a significant role in Germany’s road to the semi-finals as Khedira’s dynamism, Hummels’ passing, and Gomez’s presence provides variety to Low’s attack. It must be said, that without a natural centre-forward, the Germans often lack penetration in the final third, which increases the belief that a false-nine system can be futile for a side that doesn’t possess runners breaking beyond the opposing defence. Still, France’s standout performers – Lloris, Umtitti, and Sissoko – offer hope that the hosts may be capable of utilizing this system in the final, but it would be hugely surprising if Kante doesn’t return to the XI. Deschamps hasn’t been afraid to make bold decisions or change his XI, but the first half against Germany suggested that they’ll need a holding midfielder to avoid being overrun in central areas. Sacrificing creativity for a solid defensive foundation would be the logical move in a major cup final, and after being outwitted tactically, and outplayed in every aspect, Deschamps could use this fortuitous victory as a learning tool for the final. Both sides altered their traditional systems to secure their quarter-final triumphs, but now it’s interesting to see how Didier Deschamps and Joachim Low approach the match. Needless to say, semi-finals tend to be tight, cautious affairs that are decided by fine margins, and both managers have several key decisions to make prior to kick-off. Deschamps is expected to recall Adil Rami alongside Laurent Koscielny following his quarter-final suspension, but the main talking point is whether N’Golo Kante will be included in midfield. France have been at their utmost best at the tournament operating in a 4-4-2 with Antoine Griezmann closer to Olivier Giroud and Paul Pogba partnering Blaise Matuidi in midfield, yet with Kante in midfield, France possess solid defensive cover ahead of the back four. France were able to overturn a 1-0 deficit against Ireland and dispatch of Iceland 5-2 in those matches, but Germany offers a larger threat going forward. Neither Matuidi nor Pogba are natural holding midfielders and would likely encounter difficulties coping with Mesut Ozil, Thomas Muller, and Julian Draxler between the lines, so Kante’s return would be logical. That means France would operate in a 4-3-3 with Payet drifting centrally from the left and Griezmann darting from the right flank to combine with Giroud. Griezmann and Dmitri Payet have excelled from a central role at this tournament, but conceding too much space between the lines in exchange for creativity would be quite the gamble. Low, on the other hand, could return to a 4-2-3-1, but may consider adopting a 3-4-2-1 if Giroud plays alongside Griezmann. Mats Hummels’ suspension would see Benedikt Howedes partner Jerome Boateng at centre-back, but if Low were to persist with a three-man defence, Shkodran Mustafi would make his first start since his opening match goal against the Ukraine. Bastian Schweinsteiger should be fit to start in midfield with Toni Kroos, which ensures competent passing in central zones, but equally deprives the German’s of dynamism going forward. With Payet and Griezmann roaming between the lines, Schweinsteiger and Kroos will need to be cautious with their positioning, as France will aim to exploit the former’s limited mobility. 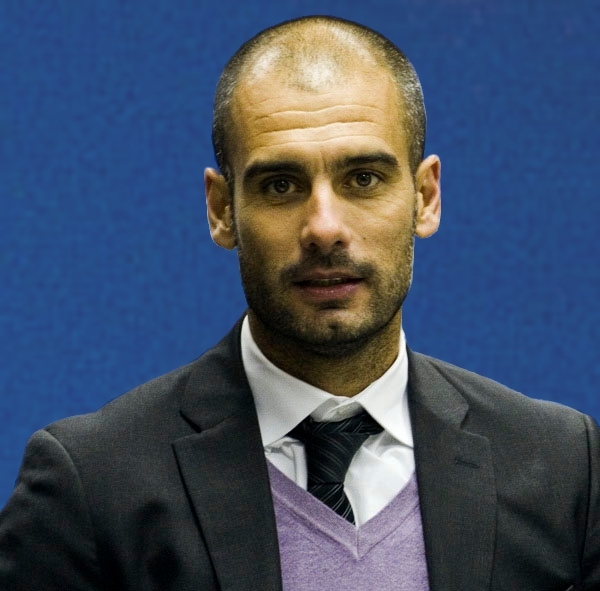 Low’s main dilemma involves replacing the injured Mario Gomez. Thomas Muller hasn’t been at his best throughout the tournament, and though he’s struggled in a no.9 role for his country, he still offers an aerial threat upfront. Mario Gotze started the tournament in a false nine role, but Germany were frankly too predictable in possession and unable to create multiple chances from open play. Gotze can still feature in an attacking midfield role, with Muller moving upfront, as precise passing and quick interchanging between the lines would pose several issues for the French. Germany can also turn to Andre Schurrle who has been utilized as a super sub over the past few years. Schurrle offers a direct threat beyond the defence, and his pace would force the French back-line to sit deeper, which could prove beneficial with Boateng and Kroos’ range of passing. In truth, Gomez’s absence is a massive blow for the Germans, because the striker offered a threat in the penalty box, thus offering variety to an attack that can sometimes become too predictable. Nevertheless, Kroos still remains the key man for Germany. France will have to be wary of Germany’s threat between the lines, but halting Kroos’ ability to dictate the tempo of the match is equally crucial. Italy were forced to have Graziano Pelle and Eder stick tight to the German throughout, and Olivier Giroud may be tasked with this duty. But with Boateng capable of deputizing as an additional playmaker from centre-back, Deschamps will have to instruct Pogba or Matuidi to press forward and negate Kroos’ threat. Nonetheless, it’s difficult to predict how this match will unfold. 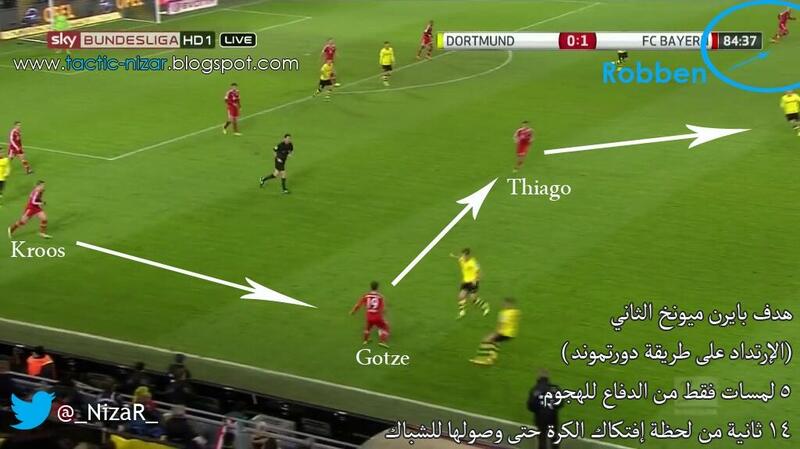 Both managers can utilize several formations and are capable of shifting between systems throughout the match. Ultimately this could be down to which midfield can negate service between the lines, but both managers may opt for defensive-minded systems to ensure they avoid defeat. While majority of the matches at this tournament have been fairly predictable, this showdown offers several plot twists that are truly fitting for a cup final. Toni Kroos made it his mission to persuade Germany manager, Joachim Low, to start the 26-year-old in their Euro 2012 semi-final exit against Italy. Consistently displaying his displeasure from the bench throughout the tournament, Kroos received extreme faith from his manager to aid Mesut Ozil in combatting with Italy’s abundance of ball-playing midfielders. 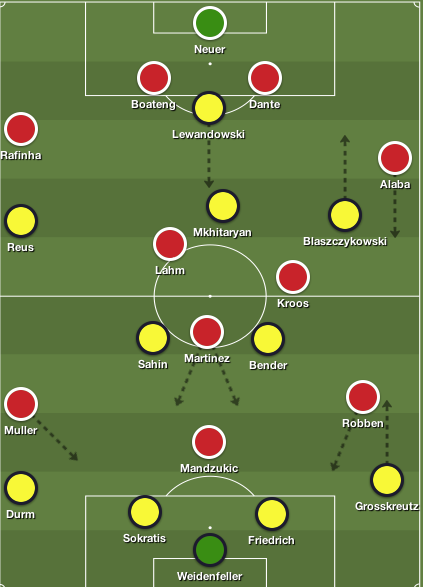 On the day, Low’s men were considerably outplayed, whereas Kroos failed to impress in a right-sided attacking midfield role that ultimately limited space in the final third for either German to maximize their talent. Four years later, in a completely different midfield role, Kroos has transitioned into key component in Low’s setup. Where the German excelled in an advanced playmaker role prior to Euro 2012, now, Kroos is at his utmost best in a midfield trio as the designated passer, rather than a destroyer or a chief creator. Ultimately it wasn’t an entirely new prospect for the Real Madrid star considering he’s always showcased his ability to fulfill various duties in central areas – put simply, Kroos is the ideal all-round midfielder that can meticulously dissect the opposition with his metronomic passing, yet is also capable of utilizing his physical stature to dominate the centre of the pitch. However, the evolution of Kroos’ game didn’t occur overnight. Since that tragic defeat to Italy in Warsaw, Kroos has played a significant role in Germany’s World Cup success, and most recently, Real Madrid’ eleventh Champions League title. From open play, Kroos sets the tone of the match with his composed passing and willingness to locate open space to receive the ball. And from set-pieces, the German’s deliveries have been the catalyst to several pivotal goals for both club and country. To be frank, his impact in midfield is unparalleled from a stylistic standpoint, as Germany are now suited to play on the counter-attack, but equally adopt a false-nine system that heavily emphasizes quick movement, constant interchanging, and possession dominance. But Kroos faced a different task in Germany’s Euro 2016 opener against Ukraine, where he was responsible for directing the route of attack, but also offering protection for a backline without the injured Mats Hummels, and the retired Phillip Lahm. Essentially, German supporters and Low would prefer Kroos perform superbly in both phases, but here, his limitations were on display. From an attacking perspective, he was one of Low’s best performers – which isn’t saying much due to several average performances from his teammates – as he recorded the most passes, created the most chances, whilst winning all of his take-ons. 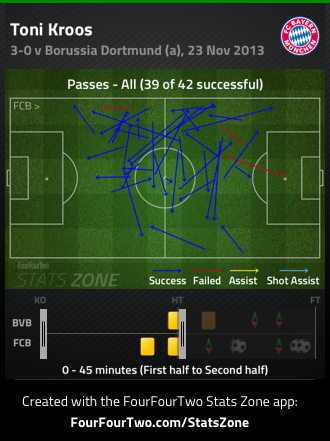 In other words, Kroos did what he does best, and that’s passing his side to victory. Whether it was quick combination plays to evade defenders, an inch-perfect free-kick that resulted in Shkodran Mustafi’s opener, or the splendid ball over the Ukraine defence for Sami Khedira, Kroos provided penetration and invention to a German side struggling to create chances from open play. Yet, out of possession – mostly in the opening half – he was left with too much space in midfield to cover, thus enabling Ukraine to pose a threat via swift counter-attacks. Nevertheless, Bastian Schweinsteiger’s late cameo and insurance goal suggests he’s nearing full-fitness, which provides Low with the midfield trio that starred in Brazil two-years ago. Schweinsteiger offers additional muscle in central areas, and a defensive shield that will enable Kroos to play within closer proximity of the interchanging attackers. 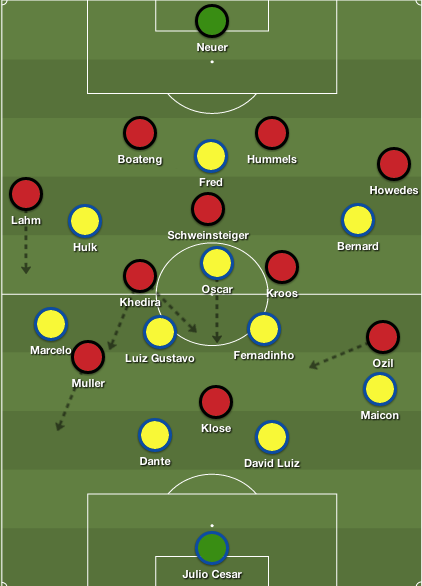 Low’s attack was at their best when they played quick intricate passes amongst each other, and while the German manager may insist several shots from outside of the box was a tactic to limit counter-attacks, in truth, they simply lacked runners behind the defence. 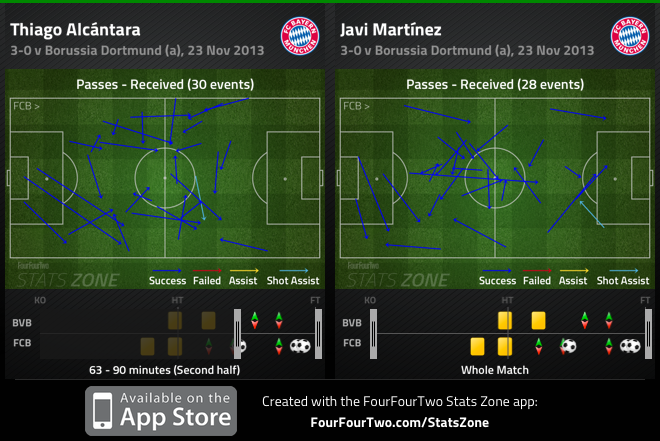 Mario Gotze didn’t offer much as a false nine, Mesut Ozil’s appreciation of space was evident, but he lacked runners to supply passes, whereas Thomas Muller’s movement from the right was lacklustre. At times, the reigning world champions were simply guilty of circulating possession casually, opposed to quickly moving forward and combining in tight spaces – they were dangerous when doing the latter. On the other hand, apart from Mustafi’s winner, and Jerome Boateng’s distribution, Germany’s defence were vulnerable when Ukraine pushed men forward to deliver crosses into the box. In fairness, Low is forced to play an inexperienced make-shift back-line, which once again emphasizes the risk of presenting Kroos with such significant defensive duties. Although Germany have developed a ‘getting the job’ done identity in recent years, there were too many underwhelming performances in one night to assume they won’t improve as the tournament progressed. Schweinsteiger’s return to fitness offers a new dimension to Low’s midfield, while Mario Gotze’s role as a false nine could be sacrificed for a classic centre forward in Mario Gomez. What can’t be denied is the numerous options available to Low, and similar to Brazil, regardless on whether he persists with the same XI or makes various changes, anything less than a winner’s medal will be deemed a failure. But unlike four years ago, Low can now rely on Kroos’ passing to control the tempo and outcome of a nations fate.